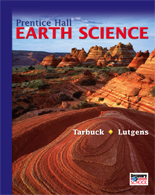 Renowned authors Edward Tarbuck and Frederick Lutgens invite students on a journey of observation, explanation, and participation in the study of Earth's processes. An accessible writing style, original artwork by Dennis Tasa, and powerful technology create a fresh new program that leads your diverse classroom on a path to discovery. This new edition is perfectly suited to today's high school curriculum. Bringing content to life, the integrated GEODe Key Concepts CD-ROM connects students to the world through video, animations, and assessment.